This WF50 purifying filter is washable for continued long term use. It is the last filter (3rd) in line on the Xpower X-2380 air scrubber. In front of it are the NSF13 washable mesh filter (2nd), and the NFR9 outer mesh fiter (1st), which prevent the larger particles and contaminant from even reaching this fine filter. When used properly with the 2 other filters on the Xpower X-2380 air scrubber, it excels in cleaning the air of harmful airborne contaminants such as hair, dander, pet allergens, mold, and bacteria. When in use, you will enjoy a fresh, clean space that is free of harmful pollutants that can contribute to and aggravate conditions such as asthma, allergies, sinus congestion/pressure, and other respiratory conditions. 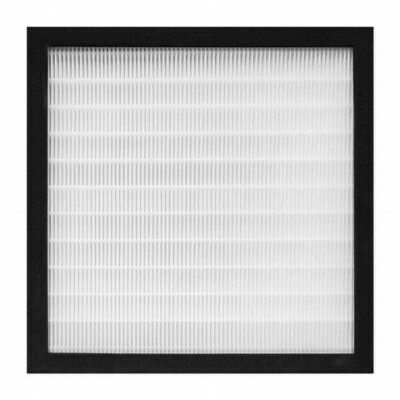 This 2.0" filter is thick, textured and pleated for maximum contaminant removal. This durable filter can be quickly removed for cleaning. Measures 13" L x 13" W x 2" T.
**Please Note - This filter can only be used on Xpower X-2380 air scrubber, and will not fit any other Xpower models. Customers who were interested in the 13" x 13" Washable 3rd Stage Filter for Xpower Pro Clean Mini Air Scrubber (X-2380 Model Only) were also interested in the following items. This is a review for the 13" x 13" Washable 3rd Stage Filter for Xpower Pro Clean Mini Air Scrubber (X-2380 Model Only).